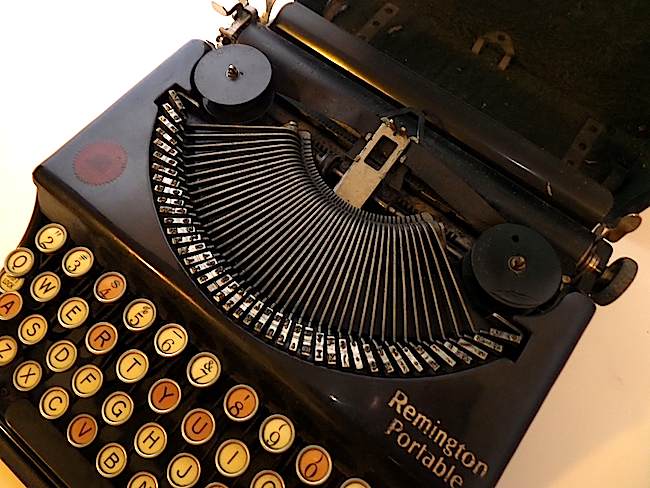 The Remington Portable [#1], introduced in 1920, is unique in that the manufacturer modified it several times over the course of production. For collectors, this creates opportunities to acquire different versions of the same model. Some 600,000 units of this typewriter were sold between October 1920 and January 1925, so acquiring one is far from difficult. But, acquiring the very earliest version, with all of the original specifications, can be challenging. Richard Polt provides the most detailed information at his site here. 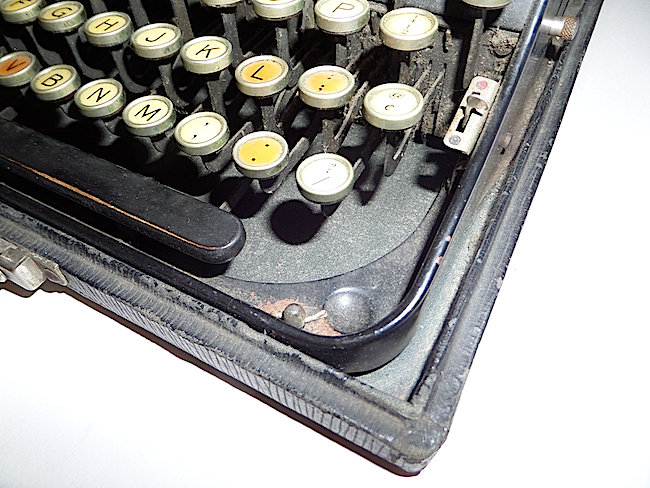 Much of what I’ve discovered about this typewriter, I learned by studying that page, pouring over its details as one might pour over baseball statistics. I now own four number ones, including two models with all of the early features listed on his site. 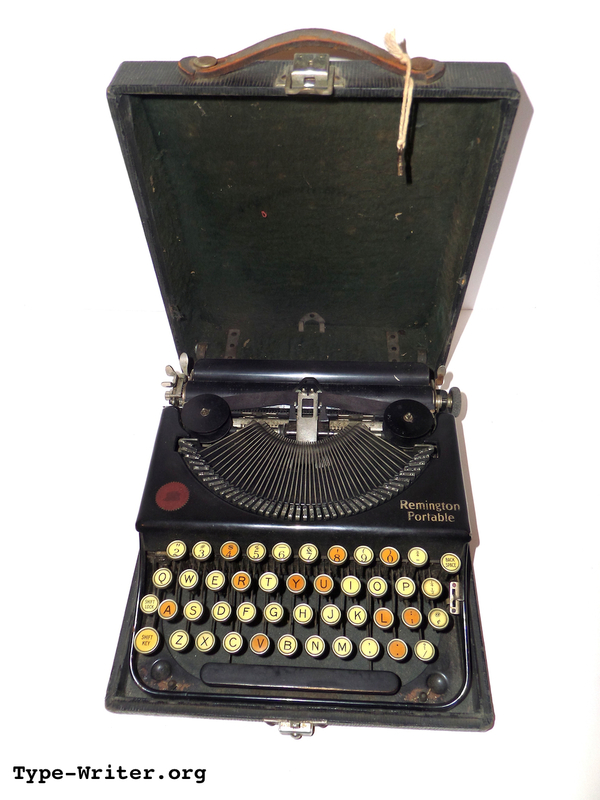 If you are looking to collect a specimen of this typewriter, visit Polt’s Remington Portables page. 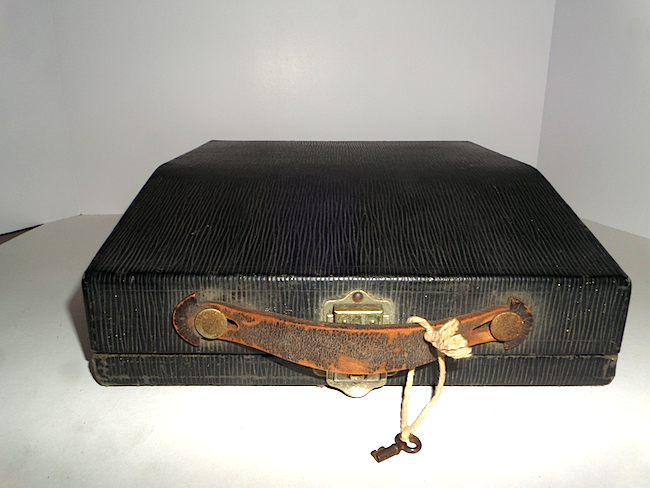 Early case with leather handle — notice how handle is attached, that’s a mark of an early #1. Rectangular-shaped type guide with rectangular opening. 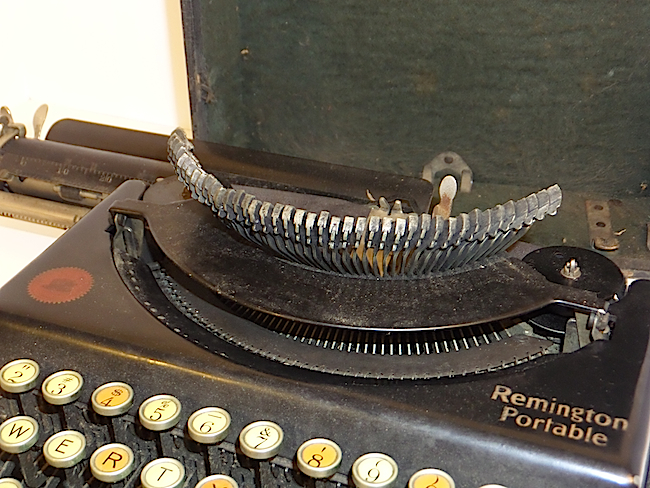 Serial number indicates typewriter was made May 1921. No felt lining on metal plate where keys rest when lowered. Notice pit marks, especially noticeable nearest red label. Only two screws on upper portion of the side. Notice lip of case that runs along the sides and front. Space bar is made of wood. 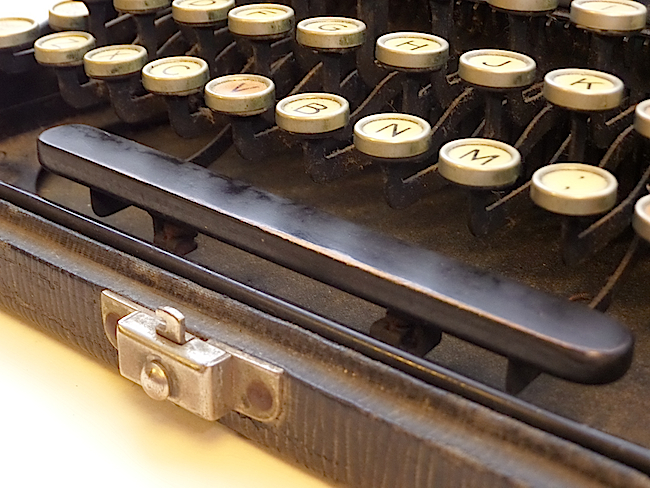 Typewriter attached with cotter pins. No right shift key, nor is there a slot for such. Excellent documentation. Your machine seems to work very well. Thanks for recommending my page! After comparing with your photos mine is missing some of the early features. It’s great to be able to find out so much and so again, thank you for taking the time to share with the world. so it will move. HELP!!!! It can be tricky. Even with the knob pushed in all the way (that can be challenging), it is a tight fit. You’ll have to position the carriage just right. 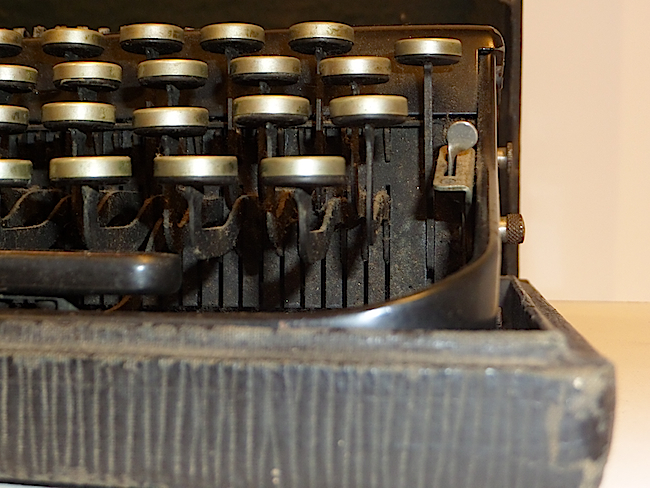 Recently viewed your YouTube video on the early Remington Portable #1 and thought you might find it interesting that I have #NX11387. This one has all the early features you demonstrate. But it does have felt lining the metal bar that the bank of keys fall back onto when lowered. 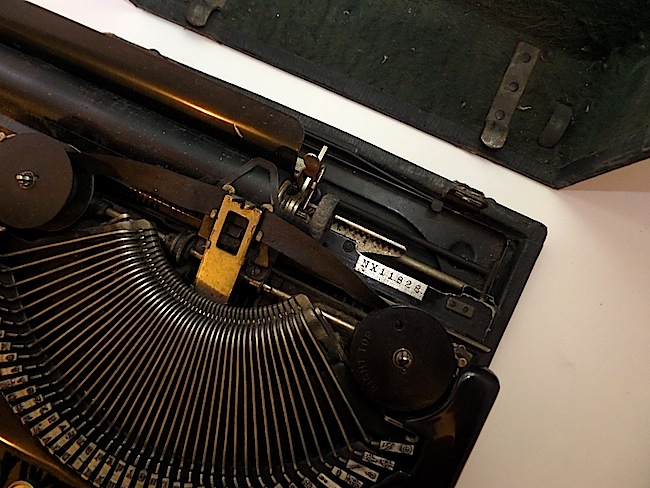 If I understand the information provided by the serial number, the typewriter I have was manufactured just shortly before the one used in your video, NX11828, which does not have the felt lining. Perhaps the felt was added to my machine later, but it looks original to the machine. That someone would add the felt lining as an after-market improvement is not improbable. It’s also possible that Remington was just not that consistent. When a feature was added is sometimes difficult to know, given that there are so many variations. 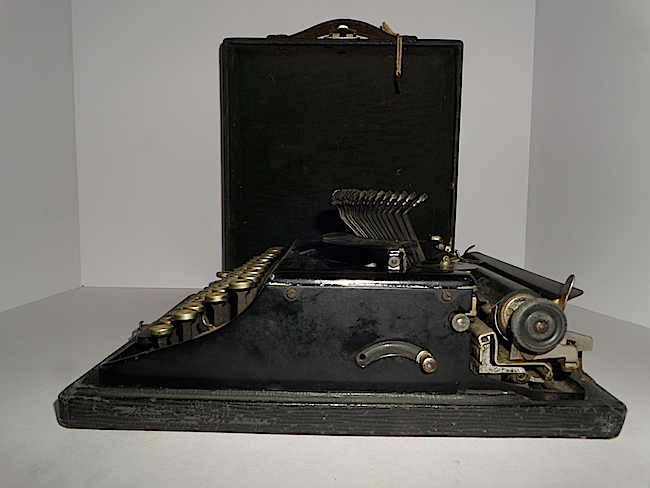 Lastly, many machines were rebuilt by the American Writing Machine Co. or the like. To what extent these machines were rebuilt likely varied. Some “old” machines might simply have needed a bit of lubing, and perhaps a bit of felt.